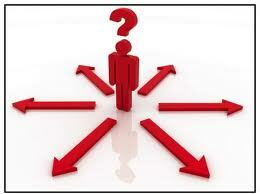 When one doesn't know what to do, it can bring up many fears, concerns, confusion and indecision. These times can also be used as a great gift in seeing that you do not ever know what you are going to do. In one sense, you are always waiting to see what will happen because you are just one slight step behind the action. But this cannot be seen while one thinks they are doing it. It is not that it is easy to begin to see this, it can be if you are slowed down enough and have been paying attention enough to allow the possibility that you don't ever know what will happen. You can think about knowing, plan about where you are going, but ultimately, until that moment arrives, you just don't know. This can be a very scary time or an interesting and exciting one. It is scary when you want something to be a certain way and you don't know how it will come about. It is interesting when, you may still want things a certain way but you are not attached to the outcome. And it is exciting, when you just let go, be where you are like the picture above and have all the possibilities available to you and not know which way you will go but alive in each moment that arrives. To be present for whatever does show up. No matter which way it comes up for you, it will go the way it goes. So if there really is a choice, it is only in whether one will wait and see or worry and plan.